2016 Tour de France Route Rumours. This page will contain all the info I come across about the route of 2016 Tour de France up to the presentation on the route in October 2015. Rumours, hearsay and wild speculation. 2016 Tour de France to start in Normandy. The 2016 Tour de France will be the 103 edition and will get under way from Manche Department, Normandy in 2016. 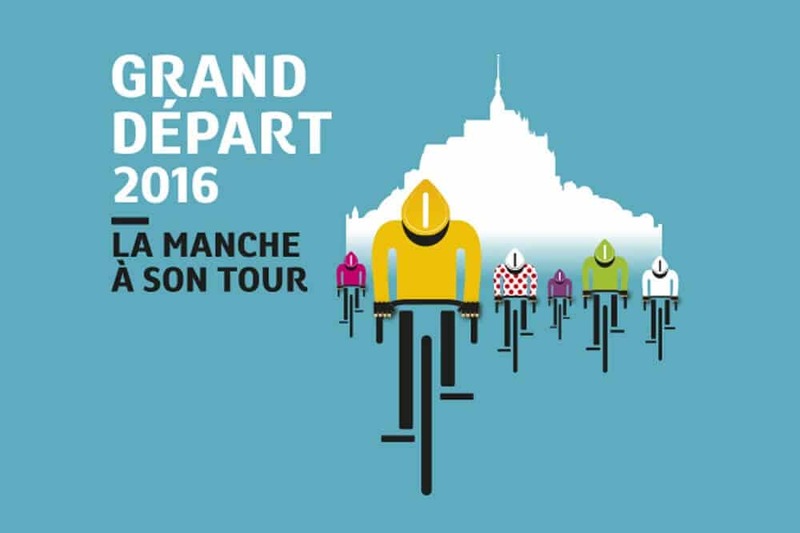 The department has welcomed the Tour de France 23 times between 1911 (Cherbourg) and 2013 (individual time-trial from Avranches to Mont-Saint-Michel), but it has never hosted the Grand Départ before. The last start in France was in 2011 in Vendee. In the aftermath of the Grand Départ in Corsica, Yorkshire and Utrecht in Holland in 2015, a spectacular visual feast will be part of the program for the beginning of the 2016 Tour, which will set off from the foot of the Mont-Saint-Michel. The riders will first follow the bay then, after crossing the Cotentin Peninsula, will head to Utah Beach, one of the 6 June, 1944 landing beaches, situated at Sainte-Marie-du-Mont. This mainly coastal route could expose the riders to wind gusts, but the totally flat profile will most certainly be to the advantage of the teams of the top sprinters. The 2016 Tour will waste little time in posing a challenge to the contenders. As early as day two of the race, Sunday July 3, 2016, the leaders will have to make themselves and their intentions known and head into battle. After leaving Saint-Lô, the race will make its way towards Coutances then back to the coast with the Channel Islands in the background. But in approaching La Hague, the riders will have to prepare for a more difficult time. The crossing from Cherbourg to Octeville will bring the peloton, or what is left of it, towards the tough La Glacerie climb. At the top there will be seconds to take after a three kilometer ascent with a 14% grade section. After crisscrossing the department and skirting its coastline, the Tour de France peloton will say goodbye to the Manche on Monday July 4, 2016. Stage three will start from the west coast port and seaside resort of Granville, for a destination that will remain unknown until October 20, 2015, the date of the 2016 Tour de France presentation. Thanks karen. Rumour locally is that le Tour will stay in Pau for 2 nights. That has been doing the rounds for sometime. Definitely not the 2016 route. Rumour of a Time Trial to Superbagneres. Any idea where the Alps stages will finish? Sorry no. Info is very scarce this year. Hi, and thanks for your rumour updates…. Velowire has the 2016 route going in the opposite direction to what you are showing??? Based on historical, 2016 TdF is scheduled to be a clockwise route as per your schedule… Appreciate your comments or thoughts….. There is very little evidence of any kind so far this year. Velowire may well be right. Generally the tour goes Alps first one year and Pyrenees first the next and so forth. But not always. The only thing that local newspapers or politicians have said is that Le Tour will visit Andorre and Pau. No dates have been given. I think that Velowire is using hotel bookings to guess that it will be in Pau on 8th July which would mean Pyrenees first. A quick search of booking.com does seem to show that the hotels usually used by ASO are booked that night. I would also expect that l’Etape will depart Pau next year. It seems contradictory as it says that the Pyrenees will be before the Alps but that a stage finishing at Payolle will come from Andorre and that the following day would depart Pau, which suggests traveling in the wrong direction. I think that a stage finish at Payolle is accurate, but the question is from where? The answer will confirm whither Le Tour is clockwise or counterclockwise. From Andorre seems too far, but a stage from Pau crossing Marie Blanque, Aubisque, Soulor and Tourmalet is possible and if so then 9th July would be the most likely date. I did hear from a very good source that an ITT from Luchon to Super-Bagneres was being considered, but that it was unlikely this year. Regards – see you on the mountains! Pau – Payolle on 9th July and Val d’Aran – Andorra on 10th. Would you have any info on team hotels in Andorra on 10th & 11th July please? Not at the moment. Perhaps closer to the date. Thanks! I’ll be watching it in the Pyrenees and following it to Andorra for the rest day, always good to see the teams at their hotels.